Simple, delicious cheese you can make at home without any additives or preservatives. What a revelation! Perfect for cannelloni, lasagna, cannoli, ravioli, calzone or the Indian dessert Ras Malai. A culinary goal for my Arctic kitchen this year was to experiment with cheese-making. I’m all for anything we can make at home in order to reduce our consumption of chemicals, stabilizers, and other weird junk. In addition to the drawbacks of processed foods, our Native Store here in Point Hope isn’t much larger than a typical quick-shop convenience store, and often doesn’t have items we need. Last year, a friend brought up ricotta cheese for us. This year, I decided to make my own. Our store does not sell cream or whole milk, so my experiment with homemade cheese had one unusual ingredient – dried milk and cream. The only powdered milk I could find during our annual summer shopping in Anchorage was non-fat. Yuck. Thank goodness for the Internet! And especially thank goodness for Amazon’s free shipping. I bought two large cans of powdered whole milk (apparently abundant in Mexico!) and a can of powdered 72% butterfat cream. These would be the main ingredients for my “ricotta.” And by the way, the end product – made with powdered ingredients – was delicious. The cheese that resulted is not a true ricotta, but is more like an unpressed paneer – with a slightly tangy, lighter taste than ricotta. In any case, it’s going into Jack’s moose cannelloni later today, rolled into homemade cannelloni tubes. Yum! Place powdered milk and cream into a large pot. Add water. Whisk until incorporated. Heat mixture until it steams but doesn’t boil (between 165 and 180 degrees F using an instant read or candy thermometer). Slowly stir in vinegar. Milk should curdle. Cover pot with clean cloth and let sit for 2 hours. Line colander with cheesecloth. I read paper towels or a kitchen towel will also work. Scoop curds out of pot and into lined colander. 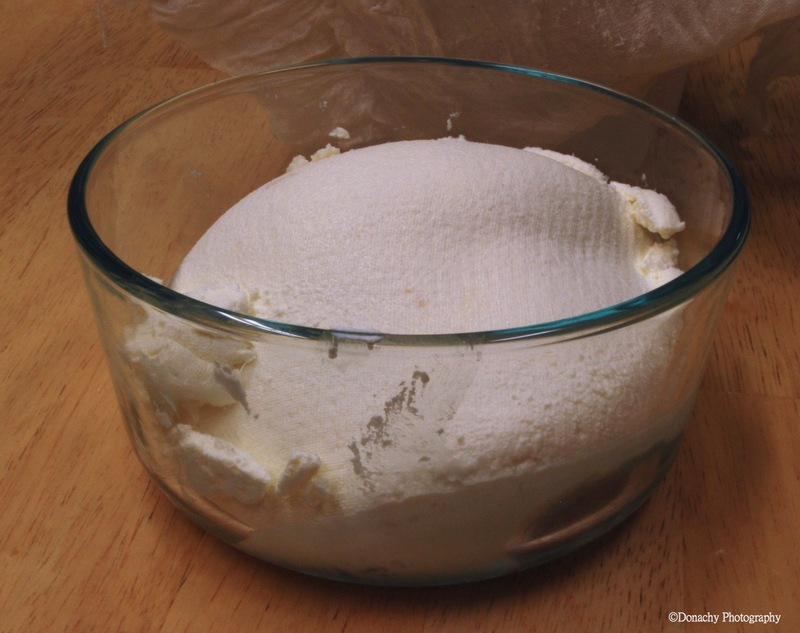 Let whey (watery substance) drain out of curds. I let it drain overnight in the refrigerator because I wanted a less watery product for the lasagna. I’ll feel extra fortunate when I crack open that container of home made goat cheese later today. . . . The cow – yes, but not the milk! That is awesomely inventive!!! Good job! Thanks Anna. Just finished having cannelloni made with this cheese for dinner. It was terrific! I made a test batch of yogurt cheese today as well. The yogurt cheese is quite a lot like cream cheese, though with a tartness.